Girls' Club launches new fellowship program, welcoming recent FAU graduate Erica Mohan to the Girls' Club team. Bridging the gap between art school and the professional workplace, the fellowship program works hands-on with young artists and professionals, combining education and practical experience to create a unique environment for professional growth. The new Fellowship Program at Girls' Club enables young arts professionals to gain substantive understanding of arts administration, programming and arts operations while contributing to Girls’ Club exhibitions and public programs. Working closely with Girls’ Club Gallery Director and Creative Director, fellows will be heavily involved in a variety of operations including curatorial, research, social media campaigns, building relationships with press, creating educational print and web content, developing curriculum, assisting in collection management and community involvement. In addition to regular programming and operations, fellows are charged with the creation of an independent community-, education- or web-based project. They will have the opportunity to direct the project from inception, to completion - creating project goals and deliverables, researching and applying for project funding, vetting team of collaborators/contributors, writing press releases and contacting local press, devising cross-platform social media campaign, documenting the project and producing final reporting data for evaluation. Erica was born in Toronto, Canada and has lived in South Florida for the past 14 years. Having recently graduated from Florida Atlantic University with a BFA in Painting, this opportunity has come at a pivotal time in Erica's own career and goals as an artist. Wishing to work to empower artists and learn more about arts, community and advocacy, Erica's own artwork investigates empowerment through combining martial arts training with painting. More information on Erica and her work can be found here. Girls’ Club presents Defining a Moment, an independent project created by Fall 2014 fellow Erica Mohan. Defining a Moment is a multi-part video blog series exploring the stories of select artists’ decisions to pursue an artistic profession and the moments that sparked their transformation. Artists were selected from the private collection of Francie Bishop Good and David Horvitz, founders of Girls’ Club, with a focus on local artists. Defining a Moment shares an intimate glimpse of artists’ personal struggles, discoveries, philosophies and fears involved with being a practicing artist in today’s society. 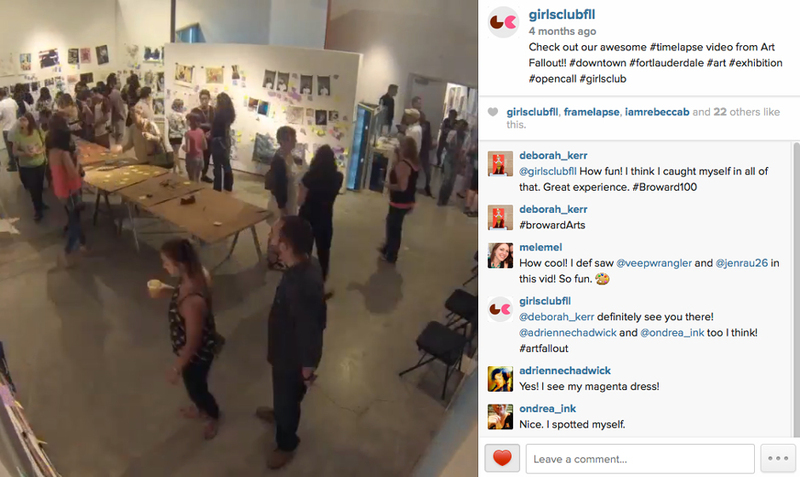 This time lapse video, posted to the Girls' Club instagram account, shows a view of the progress of sticky note comments collecting onto works of art submitted for the annual exhibition Art Fallout: Unframed, part of the community-wide event Art Fallout. Art Fallout: Unframed is an open call, one day exhibit showcasing work on paper submitted by local artists. Works are unframed, and clipped to the wall using a system of wire filament. A group of invited judges - made up of arts professionals, curators, arts writers, professors, museum professionals - make comments on purple sticky notes beside the works. The public is welcomed to comment as well, breaking down perceived barriers of communication between artists, arts professionals and the community. Working closely with our 2015 Visiting Artists Carolyn Swiszcz and Lisa Sanditz, Erica Mohan created, filmed and edited the following videos showing a glimpse of their public art talks at Girls' Club. Watch the short videos below, or head to the Girls' Club Vimeo page to view more interviews, web projects and videos from Girls' Club.